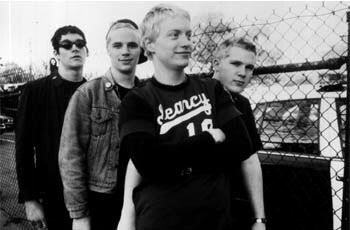 The CRIMINALS were a furious local punk phenomenon that always promised an energetic and intense live show. Jesse Luscious’ own unique vocal snarlings were backed by the driving punk pulse provided by Dan Ger on drums, Mike Sexx on bass and Brady on guitar. THE CRIMINALS balanced humor, intelligence, and high-powered riffs with inspired precision and were a great east bay punk band. They broke up at the end of 1999 after following up their great Lookout! album with a release on Adeline Records. Look for Dan and Brady in BLACK CAT MUSIC (who have a single here on Lookout!) and Jesse and Mike in THE FRISK.